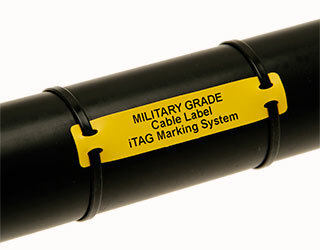 Designed to survive environments such as aerospace and military harnesses for identifying cable and wire bundles. Excellent chemical and mechanical properties with low friction surface. The new cable label meets printing and fluid resistance standards of NF F 00-608 type H, SAE-AS5942, as well as MIL-STD-202 Method 215K and SAE-AMS-DTL-23053-6 class 1 standards. The cable labels are applied to cables and harness assemblies with cable ties, and are also suitable for retrofit purposes. Markers are supplied in ladder form on a roll, having been conditioned for thermal transfer printing with our range of SumiTAG printers and qualified ribbons. Recommended temp. at +10°C to 25°C 45-55% R.H.
Tensile Strength 13.8 MPa Min. Elongation at Break 200% Min. Diesel Fuel Resistance NF F00-608 - 7MPa Min. 50x10mm 32x10mm 1,400 4 CLMS-50-10-4-** you within 24 hours.